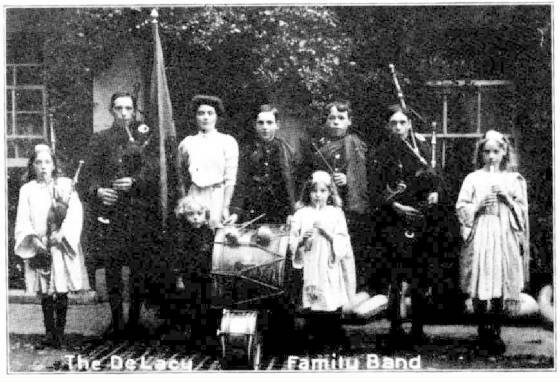 Probably the most unique band in Ireland is that composed exclusively of nine members of the DeLacy family, boys and girls, hailing from the townland of Tomsallagh, Ferns, County Wexford. As arranged in the picture their names are, from left to right in rear row: Eva Gertrude (known as Queenie), Patrick Thomas, Catherine Agatha Philomena, James Vincent, Richard Kevin, William Gervase, and Elizabeth Veronica. In front row: Leo Michael and Una Mona. Just think of it, the DeLacy family of fourteen children brought up in a laborer’s cottage with only half an acre of garden! And, by the way, that same cottage and garden won first prize for care and crops for thirteen years. There’s a record from any point of view. To the encouragement, training, and fostering care of Patrick Whelan of Scarawalsh, elsewhere sketched, the DeLacys owe not a little of the renown which their acquirements have won, although their first meeting, and the introduction of warpipes into Wexford, are due to the energy of John S. Wayland, founder of the Cork Pipers’ Club. Judging from the accounts in the papers, it seems like old times again in Wexford. On Sunday evening “Tinnacross was the rendezvous for a genial, warm-hearted gathering from all the district around,” says one of them. “The occasion was an entertainment provided by the indefatigable DeLacy Warpipers’ Band, and surely never a social gathering was more racy of the best and kindliest Irish characteristics. It is surely an omen of a more healthy social life and an indication of what progress we have already made, along the road to an Irish Ireland. A growing nation—just as, thank God, Ireland is growing—must manifest itself in varying phases, and our concerts and entertainments were as much indicative of racial spirit and racial development as greater events. To the splendid little clan belongs the honor of holding a thoroughly Irish entertainment in Tinnacross, free from every trait of Anglicization and as amusing as concert could well be.” Nearly a column is devoted to giving a detailed account of the entertainment and those who took part in it, among them being Miss Una DeLacy and Master James DeLacy, whose dancing elicited repeated applause. “Three Misses DeLacy sang a pianoforte song with beautiful effect, the action being perfect and the singing a marvel.” Such a display of versatility in one family is difficult to duplicate. It is interesting to note that some are playing their practice chanters in the above photo.